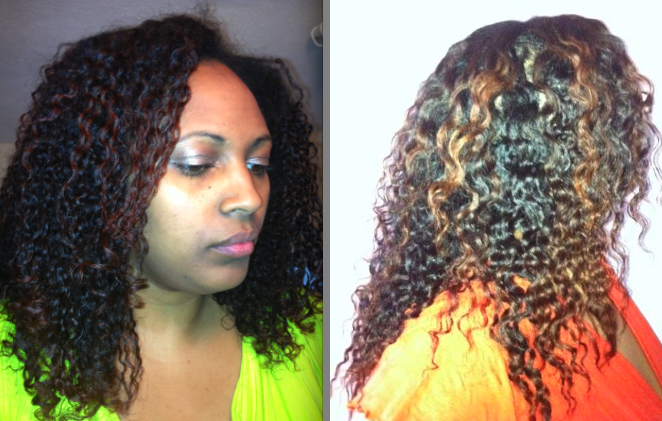 (Left) Shrunken braid out. (Right) Stretched braid out. I am a natural 4a and have been now for 4 and half years. 2) If you are natural, did you transition? Oh yes I transitioned for 18 months. I used braids and weaves to avoid the hassle of dealing with the two textures. To be honest though, by the time I came to do the big chop, majority of my relaxed hair had broken off so it was more of a small chop than anything else. I remember at first feeling really odd, naked somehow with just my little fro and without the security of hair but I got used to it pretty quickly and started to enjoy how freeing being natural was. 3) What mistakes have you made in your hair care journey? Straight after my BC like many other naturals I was crazy for wash and go's and wore my hair like that for months on end. I also found that with my 50-70% shrinkage, braid outs did not stretch my hair any more than a wash and go. I actually took pictures that showed that my hair shrunk by the same degree either way! As my hair grew longer (at the time it was around shoulder length) and as a result of all those wash and go's, I found that I was getting way too many tangles and single strand knots. I noticed that one week I would have lots of single strand knots then a few weeks later they would disappear only to be replaced pretty quickly by new ones. Eventually I came to the conclusion that my hair was breaking at the site of the single strand knots and my new mission became to avoid them at all costs. The only other major mistake that I've made was actually pretty recently when I decided to do mini twists. I had the worst tangling I've ever had in my time as a natural even though I'd only had the twists in for 2 weeks. My hair does not seem to like torsion twists of any sort so I stick with braids for styling or when I need to section my hair. 4) What is your current HEALTHY HAIR routine? My regimen changes every now and again but as a rule, I deep condition with heat weekly and shampoo my hair most weeks too. Since my moisture protein balance has long since been established and I can usually tell what my hair is in need of, sometimes I will do a quick condition (between 10-30 minutes without heat) to maintain the balance. I always wash my hair in 4-6 braids because it makes it easier to handle. Because my hair is colored I tend to err on the side of protein so I use a protein conditioner on most weeks. During grow out I will usually wear my hair in braids or weaves but I can only usually handle 2-3 weeks at a time, like many naturals I find that I miss my hair too much! Even so I find that my hair is in protective styles for up to 40% of the year. This allows me to maintain the most length. Of course once I get to goal, I probably won't do protective styles much. I do strong protein treatments every couple of months or so and I moisturize and seal as needed which is usually every other day for me. Unlike other naturals who never go anywhere near heat, I used to flat iron my hair every couple of months and have done so all through my hair journey. Having said that, since I am now grazing waist length (I hope to be at waist length by the end of the year), it's way too much work to flat iron any more so straight hair will definitely take a backseat to curly styles for the time being. My favorite go to hairstyle is a braid out because it's just so easy. I generally do it the traditional way of braiding wet to damp hair but I will sometimes do a stretch blow dry (tension method) to get my hair stretched before braiding it down. Pineapple-ing my hair every night helps to keep the curls for the entire week. I have very well documented slow growth of just 4 inches per year so I never trim my hair as a rule. I've actually trimmed it just once in 4 years, and even then it didn't feel necessary! 5) Do you have a HEALTHY BODY routine? If so, what is it? I have been interested in health for years but with so many contrasting views on the subject, in the past 10 years I have gone from one extreme diet to the other. I have been a low fat vegan and a zero carber! Unfortunately after ever stint on another extreme diet I came away with even more pounds than I started off with, classic yo yo dieting and no method has ever given me lasting weight loss. Lately I have been reading the work of Matt Stone who believes that the metabolism plays a huge role in overall health and that dieting and disordered eating is the cause of many modern diseases He works with people to get their body temperatures up to normal levels. When I first started my body temperature was a chilly 95.7 degrees and following his methods I have got it up to 97.7 first thing on waking in the morning. I am still carrying a lot of extra pounds but weight is apparently one of the last things to resolve after digestion and hormonal balance is restored. In the meantime I concentrate on getting adequate nutrition from all food groups while avoiding refined sugar and refined oils. I rarely eat out and all our food is cooked from scratch. I am also in the process of trying to reduce my chemical load by switching to natural versions of products I currently use. I am using the wonderful deodorant recipe posted on your blog which works beautifully and I am using an FIR infrared sauna to help sweat out toxins. High bun on straightened hair. 6) Do you have any advice for those seeking healthy tresses? Absolutely! There are 3 key things in my opinion to growing long healthy hair. 1. Reduce manipulation. A lot of us think of moisture as the most important aspect of growing hair long but how often you manipulate your hair will be a bigger determinant of your length. 2. Keep it simple, there are dozens of techniques, hairstyles and wonderful sounding treatments available online but you don't have to try them all in one week. Stick to a simple but consistent regimen. 3. Products are very much secondary to your hair regimen. Only your regimen will determine the health and length of your hair in the long term. 7) Where can we find you? I run and write for Black Hair Information which I set up to help women of color grow long healthy hair relaxed or natural: http://www.blackhairinformation.com. I also write about my own hair on my personal blog here: http://www.curlycurvy.com/.